The summer/fall swim session finished last week on Oct 20 with some wonderful treats from Luna. Beyond the incentive of yummy treats, sparkling blue waters and great coaching from coach Sara and coach Gracie, 9 mermaids earned full attendance awards. Coach Lisa will be sending each of the star attenders a personally signed copy of her book Triathlon for Women – A Mind-Body-Spirit Approach for Female Athletes. Well done women! The next session plans are in the works with a 10 week winter program beginning on November 10 which will be at 8:30 a.m.! Please contact Lisa if you wish to be on the registration list. So enjoy your break this weekend, however, that doesn’t mean you can’t still get in the pool for a super session to burn off all the Halloween treats! Give the Halloween Workout of the week Oct 31 a try! Be a mermaid for Halloween! This workout builds in a ladder set and gives your mind a good workout too while you keep track of the distance and rest times throughout the ladder. If you can, it is best to hold negative pacing to get the most out of the ladder sets. Treat yourself to a nutritious smoothie afterward! As before, your comments are welcomed to provide feedback on the weekly workouts and encourage other mermaids to dive in! all the Saturday workouts have been posted, please email me if you need the password. Can’t wait to see you on Saturday for our last class of the session. Be prepared for some special treats, and of course, FUN! Find the latest Workout of the week Oct 15, which is sure to challenge your core strength, leg kick strength and skill abilities with some off stroke swimming. For less advanced, you may want to reduce the yardage and sub in regular one arm drills for the fly, or for the more advanced, you may want to add in fly to get the full IM challenge! Enjoy with a friend and reward yourself with a nutritious smoothie afterward! Definitely remember to share your comments from workouts during the week to encourage other mermaids and to earn your attendance points. Check out the latest Workout of the week for Oct 1, and give it a try! 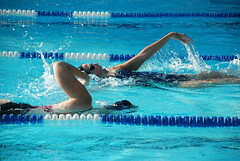 A little bit more time to focus on strength drills and your GOLF Game in the pool! Invite your friends for a game! Don’t forget to share your comments (and GOLF scores!) from workouts during the week to encourage other mermaids and to earn your attendance points.